It’s a typical evening in the BenIsrael home in north Toronto. Judy has just arrived home from work, parking her white Dodge Caravan next to her husband’s green one in the driveway. She’s a chiropractor by day, but her more demanding profession is juggling the afterschool activities of her four children, all under the age of 12. David, nine, and Jonathan, seven, are building a Lego spaceship in the dining room while Judy gets five-year-old Michael ready for his swimming lesson. Eleven-year-old Karen, the eldest child, has invited four girlfriends over after school and they’ve been up in her room for hours. During their lunch break, the girls went to Pizza Pizza, then cruised the cosmetics counter at a PharmaPlus drugstore near their school. “Let’s say Lip Smackers go on sale, we stock up,” says Danielle, one of Karen’s friends. “And we can buy, like, big containers of Coke for 991,” says Jodie, as she unwraps another piece of gum. Now, fueled by giddiness and sugar, the girls are primping themselves in front of a vanity mirror and sorting through baskets of miniature cosmetics and hair accessories, while the scent of vanilla perfume, mixed with traces of cheap nail polish and peppermint chewing gum, wafts into the hallway. One girl is applying silver highlights to her hair with a mascara brush, another is trying on frosty white lipstick, while the tallest girl stands on her toes to admire her glamorous hairstyle. After Karen’s five-year-old brother wanders into the room for a few minutes, he, too, emerges with silver highlights painted into his hair. Emily, one of Karen’s friends, flops down on the bed and starts flipping through a new teen magazine from the editors of People. The girls, with their shiny lips and baby-blue eyelids, gather around the magazine for a group session of critiquing the models, celebrities and advertisements, page by page. “Biore, oh, I heard that stuff is bad!” says Danielle, 11, pointing to an advertisement for sticky strips that remove blackheads. “It’s not Biore, it’s Ponds,” one of them says flatly. “Biore is Ponds” says another. “Whatever. That commercial is so gross!” Danielle scoffs. A trendy black-and-white ad for Calvin Klein’s unisex cologne gets mixed reactions. “It’s cool, but sometimes they have models that look really sick. They get drug addicts off the street,” says Ashley. “They also get anorexic models, which I think is disgusting,” Danielle adds. “I love Nike. Nike rules,” Jodie says as she inspects an ad identified solely by the company’s red swoosh logo. They’re old enough to watch Alanis Morisette on MuchMusic, but too young to get into an AA-rated movie. Old enough to shop at the mall for themselves, but too young for their parents to let them ride the subway alone. Although these kids aren’t easy to define, this gregarious group of girls are among the 2.4 million Canadians between the ages of nine and 14 that marketers and sociologists now call “tweens.” They may look like kids, sometimes act like kids and, until now, they’ve been treated like kids, but tweens are swiftly becoming the newest-and the most influential-consumer group to emerge in today’s marketplace. And it’s not just jean brands and cosmetic companies that are targeting tweens. Panasonic Canada Inc., Schneider Corp., Bank of Montreal, Gillette Co. and Pillsbury Co., are among the companies that have expanded their marketing efforts to address the tween audience. L’Oreal SA launched a line of hair-care products targeted directly at kids at the low end of the tween demographic. CIBC offers to deposit $5 in kids’ bank accounts when they collect five special coins from participating Kellogg cereals. The tween market has grown so lucrative that in February the Institute for International Research, the world’s largest conference company, organized a conference in Toronto focusing on how to sell to tweens. So far, it has worked. Today, approximately 10 million viewers watch YTV every week. While its programming includes blocks for younger viewers as well, YTV’s audience is principally made up of tweens. 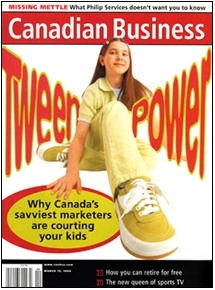 According to the network’s director of research, Julie Look, advertisers have wanted to target this age segment for some time, but there was no thorough research on tweens’ purchasing habits, In 1995 YTV initiated a multi-year research program that would isolate tween attitudes. Last year, YTV researchers conducted 45minute personal interviews with 770 randomly selected tweens nationwide. And, although the report comes with a hefty $1,700 price tag, YTV is happy to share information on the affluence of its young audience. Smart marketers recognize that kids are not only deciding how to spend their own money, but their tastes have a major impact on family purchases as well. YI V’s tween survey showed that nine out of 10 tweens have influence over the purchase of their own clothes and shoes; eight out of 10 tweens get a say in what games and toys, snack foods and restaurants the family chooses; and three out of 10 influence the purchase of a family car. Pigeon describes the traditional market profile of a nine-year-old as “some Barbie-carrying, whining kid clinging to mom’s skirt saying, `Please, buy me this. '” In reality, these kids often know the current brands much better than their parents do and aren’t afraid to recommend brand purchases. Tweens’ financial clout will continue to grow. Derek Holt, an economist for the Royal Bank of Canada, has looked at the two major waves of inheritances over the next four decades. The first wave is the inheritance the 9.8 million boomers will receive from their 6.3 million parents. The second wave will be much more significant, he says, because the 9.8 million boomers will leave their money to only 7.3 million kids. Financial institutions are realizing that tweens represent the next generation of potential investors. GT Global Mutual Funds was the first out of the gate with a program called “FUNds for Kids.” When a gift-giver invests a minimum of $500 in the firm’s regular mutual funds in trust, the child receives a kit with everything he or she has ever wanted to know about mutual funds. There are two different kits, one for kids under the age of nine and one for kids nine and older. The kit for tweens includes a GT Global T-shirt, a mock ownership certificate and an Archie-style comic book in which teenaged animal characters explain concepts such as foreign investing, asset allocation and compound interest. More than 3,000 kits have been distributed since the launch of the program in 1996. According to GT Global’s Laura Curtis, the marketing success of the program was a fortunate, but unintended, benefit. “It was always meant as an educational program and, as it so happens, it has turned into a marketing campaign,” she says. Still, for all the money and effort being poured into the market, there remains an awful asymmetry about tweens. They are, as a generation, skeptical, media-savvy and almost preposterously well-informed about the world around them, yet we know very little about them. Like the aliens on XFiles, tweens can probe our minds, but we can hardly even see inside their spaceship. On top of that, they’re highly transitional-neither children nor teenagers-something that is reflected in the volatility of their tastes. “They have a foot in two worlds” says Gene Del Vecchio the resident kids’ expert at the Los Angeles office of marketing firm Ogilvy & Mather and author of Creating Ever-Cool: A Marketer’s Guide to a Kid’s Heart. “If you shoot too high, you might frighten them away. If you shoot too low, they’ll call you babyish.” For every company like YTV that succeeds in catering to the new market, there are others, like Levi Strauss & Co., that ignore it to their peril. Make no mistake about it: tweens have landed. To get kids to choose between similar products, Brierley came up with the idea of lining up the products in a row and giving each kid a can of high-powered silly string: every time they name something that is wrong with the product, they can give it a blast. By the end, the product with the largest pile of string is the one they like the least. GT Global used a similar technique when it launched its program. More than 300 kids turned up for the company’s corporate-sponsored investment carnival held in Toronto’s TD Centre courtyard, the hub of corporate Canada. One of the more popular events was the Diversification Game, for which tweens threw beanbags at four pillars marked “bonds,” “stocks,” “mutual funds,” and “cash under mattress.” The kids who were well-diversified could buy the best prizes. Unlike teenagers, who become cynical and tend to reject any image that seems to come from an adult source, tweens are an open audience for branded products, says Lynne DeCew of Imagination Youth Marketing. “Since tweens are highly peer-oriented, a brand that gets it right can quickly become a must-have for almost every tween.” The enormous success of Tamagotchis, an egg-shaped virtual-reality toy, and the more recent obsession with collectible Beanie Babies, attest to the passion with which tweens respond to trends-and some manufacturers are cashing in with very successful loyalty programs modeled on those already used for adults. The first such loyalty program was the Nintendo Power Club. After only two years, more than 500,000 Canadian kids joined the Club. Last year, Kraft Foods Inc.’s Kool-Aid hooked up with Microsoft Corp. to launch the $9-million Kool-Aid Mega Mountain Twists marketing campaign. In-store displays of Kool-Aid feature $5 rebate tearsheets for Microsoft’s mountain-climbing simulation CD-ROM. When kids buy the video game, they get 12 points to use toward Kool-Aid’s long-standing loyalty program, Wacky Warehouse. As tweens age, other companies will see the benefits of nurturing early connections. “They can be extremely brand-loyal if marketers can reach them at an early age,” says YTV’s Look. The return of everything from Batman and Bilko to hippies and Happy Days, has given boomers the false sense that, in the words of Yogi Berra, “It’s deja vu all over again.” “Boomers feel their children re flect on their lifestyle and reflect on them,” says Carol Green Levenstein of Children’s Creative Marketing Inc. “They want their children to look like them and to embody the values that are important to them.” But marketers who treat tweens as nothing more than mini-boomers-and who fail to recognize this group’s unique attributes-are likely to fall flat. Levi’s, the world’s largest clothing manufacturer, learned that lesson the hard way. The company all but ignored the huge impact of the inner-city move toward wide-leg jeans in the early ’90s, while top-end designers such as Tommy Hilfiger and Ralph Lauren responded to this youth-driven trend. Levi’s faced a massive drop in market share (to less than 20% of the US blue-jeans market last year from an estimated 30.9% in 1990, according to New York researching firm Tactical Retail Monitor Inc.). The brand that once had been synonymous with teenage rebellion had become the industry nerd. Last July, Levi’s executives poured over the results of a year-long research project on what US youth thought about the legendary brand. The fashion-conscious kids gave Levi’s a thumbs-down in the category widely known to make or break a product for this set: coolness. At about the same time, Levi’s was set to debut its Special Reserve jeans, a line of specialty, vintage items that would appeal to Levi’s loyal adult consumers. In an unprecedented move, Levi’s US president, Thomas Fanoe, canceled the entire product launch, nearly a year in the making. Instead of launching the new product, Levi’s decided to revitalize its younger, baggy-fit Silver Tab line, which was already receiving kid approval. Then, late last summer, Levi’s announced the launch of its largest-ever campaign, called “They Go On,” to rebuild the brand’s youthful image. The campaign followed the introduction of a massive wide-leg jean advertising blitz that carried the tag line “It’s Wide Open.” The funky national TV campaign was the first step toward jazzing up Levi’s image-before it was too late. This year, Levi’s plans to introduce new packaging and labeling and to rework its retail strategy. Instead of opening more stores in malls, Levi’s plans to follow the Nike approach by opening flagship mega-stores in major urban centres. Expect to see the first one open in Levi’s hometown, San Fransisco, in 1999. Today’s tweens are more serious about education than was any group that preceded them. The YTV survey found that 83% of tweens said school is important to their future and that getting good grades in school ranked highest on a scale of what it takes to be “cool.” The survey also found that seven of 10 kids planned to attend university. “Kids recognize that things change at a rapid pace, and unless they keep up and get good marks… the future is not as laid out for them as it was for their parents,” says Look. The increased emphasis on education might be contributing to the growth of a corporate presence in schools. There are now 310 corporate programs in 38 schools in Ontario’s Etobicoke School Boardmore than in any other school board in North America. Kraft Canada Inc. distributes a newsletter in schools that promotes the importance of nutrition, and Gillette Canada Inc. gives out kits, filled with its products, that are then distributed in health classes. About a year ago, advertisements began appearing on school buses in York Region, just outside Toronto. In October 1997, a consortium of 13 school boards signed a contract with School Bus Media to place ads on the interior and exterior of a fleet of 2,500 school buses in Southwestern Ontario. And education goes beyond school. Between computer camp, ballet class, soccer practices and second-language programs, today’s tweens lead very structured lives. “Kids aren’t home watching Saturday morning cartoons anymore,” says Del Vecchio. The loss of the guaranteed Saturdaymorning market is another reason Del Vecchio suggests marketers turn to education to reach achievement-oriented tweens. In January 1997, Binney & Smith Inc., maker of Crayola products, launched its new “Crayola iQ” line of art supplies. These products are intended to appeal to older kids interested in real functionality and performance, says Peter Sgromo, who handles the Crayola account for Binney & Smith Canada. Abandoning Crayola’s 90year-old trademark yellow and green packaging, the iQ line, with its more vibrantly colored pencils, chisel-tip markers and non-washable watercolor paints, is housed in sleek new packaging that has been likened to that of Gucci. Tweens like to see themselves as being a few years older than they actually are, but aiming at kids in that aspirational mode is a tricky proposition. The retail chain Le Chateau has been outfitting teenaged and twenty-something fashion victims since 1959. A few years ago, its marketing department noticed a surge among the six-to-14-year-old set. “The younger customers were fitting into the smaller sizes of the adult line,” says Franco Rocchi, VP sales at Chateau Stores of Canada Ltd.’s Montreal head office. “So we decided to test a junior line [called Junior Girl] and it received a phenomenal response.” Le Chateau then decided to target the preteen group as a separate market with its own brand, a separate icon, logo and bags. Last October, Le Chateau opened its flagship theme store on Toronto’s ultra-hip Queen Street strip. The 15,000-sq.-ft. mini-department store contains nearly every pop-culture reference from the past 40 years, including tie dyed candles, lava lamps and velvet cat’s-eye sunglasses. Chateauworks, as the flagship store is called, is designed as a place for the young and hip to lounge for an afternoon and have their hair dyed purple or indulge in an aromatherapy treatment. “They want to be unconventional,” Rocchi says of today’s fashion conscious tweens. “They’re more aware of the hot brands and they can’t wait to spend.” In response to demanding tweens, Le Chateau is happy to dedicate square footage to these kids in every store. “They’re not bargain hunters. They’re open and ready to try on-or discard trends.” Plans to open a Montreal Chateauworks are set for the fall. Over half of Canadian tweens have access to the Internet at home. According to DeCew, tweens are the only real surfers left. Research indicates that the frequency and length of Internet access increases with age until kids reach junior high school, and then it actually drops off. The acceleration of today’s technology-driven culture has created a situation in which children play the role of information gatherer for the family. And, while some companies are tapping into their ability to reach kids on-screen-the YTV interactive Web site alone receives 3.7 million hits per week-others are successfully mimicking some of the characteristics of Web surfing in their products. Schneider’s Lunchmate is doing both. The company takes an interactive approach to its line of lunch kits-a meal that encourages kids to take part in the creation of their lunches. The pizza kit, for example, contains three miniature pies, a packet of tomato sauce and two compartments of shredded cheese. Kids can assemble the pizza and then play the games and puzzles on the inside of the package. “You decide the outcome of the lunch,” says Rhonda Asbreuk, product manager at Schneider. She says Schneider didn’t see the Internet as a promotional tool until the lunch kit was repositioned for school-age children who are frequent Internet users. She says both the product and the marketing campaign will remain interactive by encouraging kids to go on Schneider’s Web site and invent the next Lunchmate. Schneider’s experience is an example of something else happening in today’s marketplace: time and time again, existing products are being made over for the tween market. Lunch kits, which had been on the market for about seven years, were targeted at school-age children, but their secondary market was working mothers who bought Lunchmate for a light lunch or snack for themselves. “We have a real trust relationship with the parent,” says Asbreuk. “But we haven’t yet won over children as consumers.” And, while kids used to select products from TV advertisements and ask their parents to buy them, today’s kids are making their own purchasing decisions in-store. Plewes explains this process during a tour of a Toronto Loblaws store, something he suggests many of his clients do. “We have to have a good idea of everything the consumer is being exposed to,” he says as he walks toward the store’s large magazine rack. “Magazines are a good way to judge, because they really cater to kids’ attitudes.” To find examples of how to appeal to the tween market, Plewes looks to the niche magazines catering to skateboarders, snowboarders and video-game junkies. He holds up a package of Schneider’s Lunchmate next to the cover of Super Teen magazine. Both titles are boldly colored capital letters outlined in a wide border of another color. A green swirling background, along with distorted, misaligned letters, portray the energy, attitude and exuberance that is the language of tweens, he says. Plewes then reaches for a package of the lunch kit competitor, Oscar Mayer Lunchables. Although the basic yellow and green colors are the same as those on the Lunchmate package, Lunchables’ flat, stencil logo sits neatly across a green checkerboard background contained by a broad yellow border. In order to find the design inspiration for this product, Plewes would have to look to another section of the magazine rack, perhaps the one that holds Popular Mechanics. Plewes’ shock at what his own daughter reads is evidence of what every good marketer knows but doesn’t want to admit: that tweens, perhaps more than other age groups, are awfully difficult to pin down. With their short attention spans, their distrust of advertising and their appetite for the next big thing, tweens present a frightening target. How can you tell what they’ll want next? By dinnertime, the floor of Karen Ben-Israel’s bedroom is littered with hair clips and gum wrappers. The girls are passing around a portable phone, each taking a turn talking to Adam, a boy from their class. Ashley is the last to speak to him. She hangs up and tells the others that he wants to go see the Spice Girls’ movie, “in a group.” After a moment of teasing her, attention turns back to the magazine and a photograph of trendy teenagers in baggy jeans and chunky shoes. “That’s because they’re a model from five years ago, Ash,” Danielle shoots back, with a brace-faced grin. “I can never find jeans that fit me!” shreiks Emily, who, instead, sports a pair of baggy navy blue sweatpants. “I’m, like, in between everything,” grumbles Jodie. In between everything. Well, at least for now. It won’t be long before these girls grow the few inches that will take them into the world of teen fashions and, before you can say “millennium,” they’ll be well on their way to becoming the most lucrative generation of adult consumers since their parents moved from protests to purchases.